Our seventh issue of Ōtaki Today has a bit of theme – innovation and achievement. 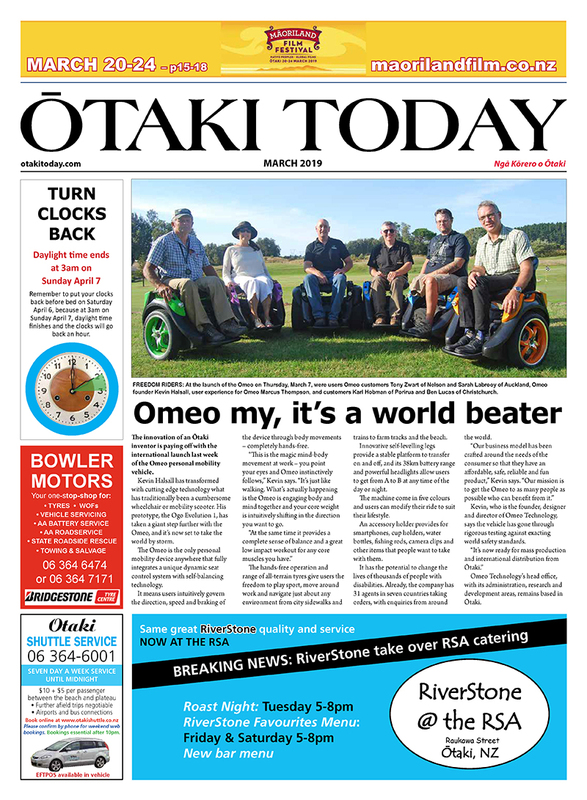 Our lead story is about the amazing Ōtaki inventor, Kevin Halsall, who's designed and built what was originally the Ogo personal mobility vehicle – now called Omeo. Kevin's put some world-beating technology into this vehicle, and now he's ready to take it to the international market. The Omeo has the potential to change the lives of millions of people who have disabilities. We also cover the plan of Phil Malpas, who wants to establish a big solar power plant at Ōtaki. The power would be enough to run up to 500 homes. Then there's the achievements of young rugby star Kiki Tahere, who could be at the next Olympics. And James Kereama Stent and Tui Tahere Katene, who were spotted at last month's kite festival and now have gigs a-plenty. We enjoyed covering the Bikes in Schools programme for Ōtaki School. Some high-powered dignitaries turned up to help hand over 54 bikes to excited kids. And there's lots more news, and views from our regular columnists, plus a fascinating article by local scientist Steve Roxburgh of Hebe Botanicals. He's written about what 'vegetable oil' really is. Click the cover image to read online, pick up a paper at the library or from news stands at RiverStone Café, Te Horo Café, Café 66, Beach dairy, Gorge Café and Brown Acres Market (Manakau). Original generation time 2.8528 seconds.